Frame Relay has become one of the most extensively-used WAN protocols. Its cheapness (compared to leased lines) provided one reason for its popularity. The extreme simplicity of configuring user equipment in a Frame Relay network offers another reason for Frame Relay’s popularity. 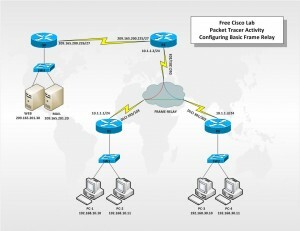 In this Cisco Packet Tracer lab activity, you will configure Frame Relay on the serial 0/0/0 interfaces of routers R1, R2, and R3. You will also configure two static Frame Relay maps on each router to reach the other two routers. Although the LMI type is autosensed on the routers, you will statically assign the type by manually configuring the LMI.